RIO DE JANEIRO, BRAZIL – Traveling in the Cidade Maravilhosa offers sensory overload in several areas, visually stunning beaches and mountains, amazing sounds of samba, as well as culinary adventures waiting to be explored. Three dining experiences; the churrascaria (a style of barbequing), rodizios (all you can eat), and the kilos (pay as you go), are all essentials when traveling in Brazil. The churrascaria is a style of barbeque most often serving beef, but can also be pork, chicken, lamb and interesting combinations, photo by Arnold Gatilao/Flickr Creative Commons License. Churrasco is a style of meat preparation, a type of barbeque common in Latin America and arguably perfected in Brazil. 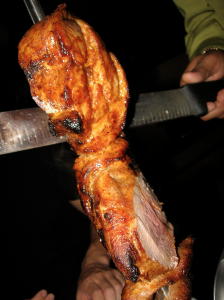 Unlike the barbeque encountered in North America, where the meat is placed directly on the grill, churrasco is typically skewered and left to cook above burning coals or wood. This style of preparation is engrained in the cattle raising history of Brazil’s southern region, originating with the gauchos of Rio Grande do Sul, but has gained popularity throughout Brazil and beyond. The beauty lays in the simplicity of the seasoning, often just sea salt, which focuses the attention on the quality of the meat rather than the flavor of the sauce (as “wet” barbeque in the U.S. often does). Visitors to Brazil might assume that rodizios and churrascarias are the same thing at first. However, rodizio specifically refers to a style of service where patrons pay a flat rate and enjoy a buffet served at their table by waiters continually passing with more food. Rodizio service is very common at churrascarias though, where crisply dressed waiters with skewers filled with meat stop at your table and offer a variety of cuts (like beef, pork and food wrapped in bacon) until you indicate your inability to eat anymore. Yet many rodizios in Rio also serve different types of all-you-can-eat fare and are perhaps most often associated with sushi in Rio. In the heart of Rio’s Zona Sul (South Zone), Ipanema hosts some of the city’s best, Nik Sushi and Yosuki Sushi both offer rodizios, where the size difference between stomach and eyes can be made painfully clear. Anyone who has visited Rio’s famous Porcão churrascarias knows this reality and the inner-debate that accompanies the decision to turn the serving disk from the green “yes” to the red “no”. Kilos may solve this problem for some by providing churrasco, along with a wide variety of other dishes, on a pay by weight basis. 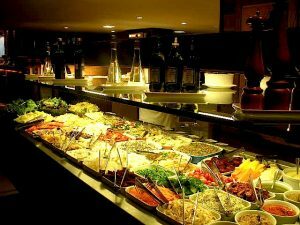 The salad bar at Frontera in Leblon, one of the higher-end kilo restaurant options, photo by Sibel Tinar. Instead of ordering à la carte from a menu or all-you-can eat from rodizios, kilo restaurants charge a fixed price per kilo of food taken. This type of dining is incredibly popular during lunch hour, as patrons can enjoy a sampling of many different dishes at the same time. The value and quality of kilos varies, though it is not uncommon to enjoy an impressive offering at a smaller cost than a traditional restaurant. Many kilo restaurants include a churrasco section where patrons can choose different cuts of meat as well as “nozinho” (grilled cheese,) priced per kilo. For those who disagree with eating meat in general and churrasco in particular, no worries, vegetarian kilos can be found in most cities in Brazil such as Tempeh in Rio’s city center. Churrascarias, rodizios, and kilos are only three of the more common popular dining experiences a person can enjoy in Brazil. As with all dining in the country, visits to these establishments are both a lesson in culture as well as geography.